Designed for color-intensive printing or any project that needs to look its best. The ultra-smooth surface and heavier weight produce professional-looking design proposals, brochures, and full color presentations. 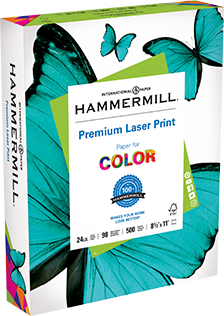 Premium Laser Print is manufactured to run in all laser and color printers. Ultra smooth surface specially formulated for superior color images and text. Capable of holding up to 2400 dpi resolution. Excellent print contrast and true color reproduction.